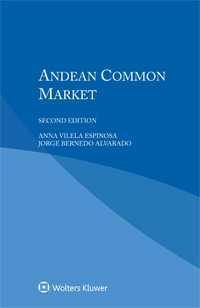 Derived from the renowned multi-volume International Encyclopaedia of Laws, this practical analysis of the structure, competence, and management of Andean Common Market provides substantial and readily accessible information for lawyers, academics, and policymakers likely to have dealings with its activities and data. No other book gives such a clear, uncomplicated description of the organization’s role, its rules and how they are applied, its place in the framework of international law, or its relations with other organizations. The monograph proceeds logically from the organization’s genesis and historical development to the structure of its membership, its various organs and their mandates, its role in intergovernmental cooperation, and its interaction with decisions taken at the national level. Its competence, its financial management, and the nature and applicability of its data and publications are fully described. Systematic in presentation, this valuable time-saving resource offers the quickest, easiest way to acquire a sound understanding of the workings of Andean Common Market for all interested parties. Students and teachers of international law will find it especially valuable as an essential component of the rapidly growing and changing global legal milieu.